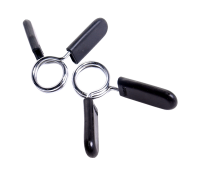 Spring Clip Collar - 1"
Chrome-plated and easy-grip handles make the Spring Clip Collar easy to fasten and remove from is bar. Fits all 1" (diameter) standard bars. Spring Clip Collar - 2"
Chrome-plated and easy-grip handles make the Spring Clip Collar easy to fasten and remove from is bar.